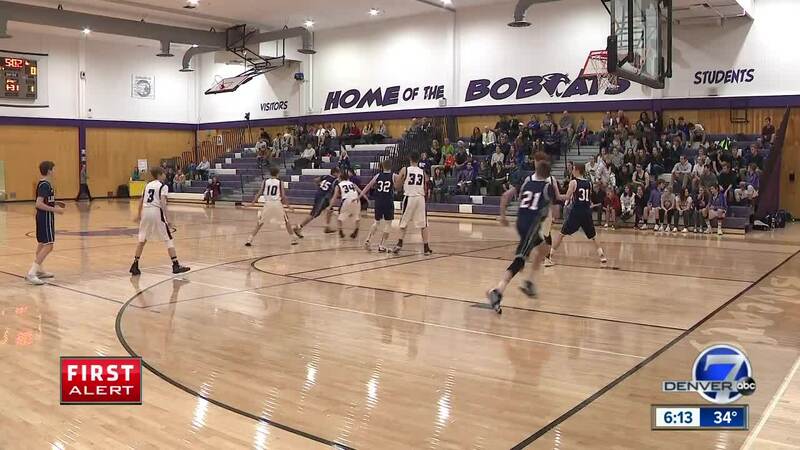 ESTES PARK, Colo. — The Estes Park High School boys basketball team won their most recent game against Liberty Common. But something else, and possibly far more important, happened on the court that night. Noah Olson and Mark Query have been on the team all year. They attend practice, run drills, and attend in both home and away games. They also both have Down syndrome, with Mark also living with autism. On this night, Noah entered the game near the end of the first half. After a few attempts, he scored. The crowd erupted. Nearing the end of the third quarter, it was Mark’s turn. After a few tries of his own, he sunk a basket to an even louder ovation. “When the entire auditorium erupts when he makes a basket, as a dad, it’s indescribable,” his dad said. But this wasn’t a one-time special occasion. It wasn’t a special senior night for some team managers. Noah and Mark are full time members of the team that do this fairly regularly. These two boys are the heart of their team, fully embraced by this small community. “Special needs kids tend to have few friends but (the boys are) surrounded by friends,” Mark’s dad said. “They accept them, they love them for who they are, they want them to be a part of things,” Noah’s mom added. The boys usually play, and also usually score. The thing that made this night different was what happened in the fourth quarter. The boys are best friends and normally practice together. They usually don’t get a chance to take the floor together. On this night, they did. Each boy missed their first few attempts. But with seconds winding down in the game, Noah got his hands on the ball. Without hesitating, he turned and passed to Mark. He was the one to put up a shot, which floated in. “They make it, you see the smile ear to ear, the crowd, the sound, it’s just the best feeling in the world,” their coach said.